This is a depiction of a memory and dream infused together in my mind. 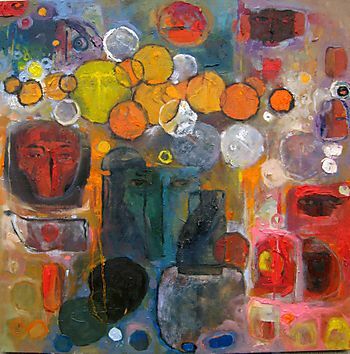 The circles represent an element of Ethiopian traditional that have been changed into a modern concept that create an airy space and volume in the painting. In this age, painting has become more spontaneous because of the technique of working in the subconcious mind which allows a painter to paint what he truly feels. The painter is also able to capture thoughts that flash into the mind and be transformed into an art form. However, the composition of this piece breaks the traditional symmetrical attributes to my other paintings. Thus, this painting is like a new birth for me that gave me the idea to create my next painting The Beginning.